When people see arborists in trees with ropes and chainsaws, they may not realize that there is "science" to their work. 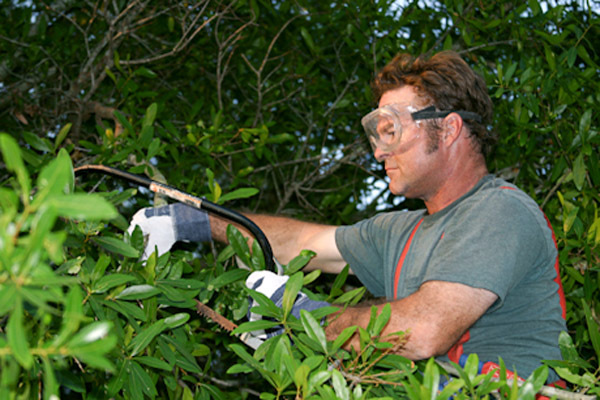 Just like every other procedure that Specialty Tree Surgeons employs, our pruning procedures are based on the most current research and industry standards. Trees are active living organisms. Every living branch of a tree serves a purpose in maintaining the overall health of the tree. Branches serve a vital role by extending foliage out to the edge of the canopy where the leaves can photosynthesize. The energy that is captured by the leaves is then transported through the branch to other parts of the tree. When a live limb is removed a source of energy and food production is also lost. In turn, when a branch no longer provides energy in excess of its needs, the tree will isolate the branch and allocate its energy stores to other areas of the tree. This is why internal branches decline once they become shaded. A tree only survives by increasing or maintaining a positive energy flow. Removing declining or dead limbs, does little to disrupt the overall health of a tree, but can help a tree respond better to the damage. In addition to energy production, branches also "balance" the structural integrity of the tree. Watch the branches of a tree move in the wind. They certainly don't all go in the same direction. One limb will balance another across from the tree or two or three branches may balance each other like a cantilever. This whole connectivity within the tree is crucial to consider when planning pruning activities. When a branch is damaged or removed, it not only affects the balance of that branch, but also the balance of the canopy, trunk and even the roots of the tree. When a limb dies or starts to decline, a tree will attempt to create a boundary zone to prevent any infection from gaining entry to living tissue. This process is termed "compartmentalization". If an infection gets through this prevention zone the tree will be susceptible to decay organisms and potentially life threatening insects and diseases. While the impact of decay may be minimal with a tree in the middle of the forest, it can create a hazardous situation when the tree is next to a house or another valuable structure. The potential for decay from a wound or pruning cut is significantly higher in fast growing trees like cottonwoods, willows, boxelders and silver maples. With these trees it is imperative that a pruning cut be made "correctly" to protect the zone of compartmentalization. Otherwise, the decline of the structural integrity of the tree will be rapid. While slower growing trees like oaks and walnuts are more resistant to decay, correct pruning cuts can delay and even prevent the initiation and spread of infecting fungi. Unlike humans, trees cannot create scabs or "heal" wounds. New tissue will eventually be created from where the live tissue remains, between the wood and the bark. But, unlike a scab, it will not heal the damage or infection.It will just grow over the damaged tissue, creating a weak point within the tree structure. The key to successful branch removal is to know where that zone of protection occurs and to keep it intact. Like a skilled surgeon, an arborist needs to know where to amputate the limb with the least impact on the health of the tree and its integrity.